So have you ever thought to yourself... Why won't he STOP BARKING! If it's one thing that Schnauzer owners know all too well, it's that dogs bark, and bark and bark! And unless of course, there is some immediate threat or danger that we should be alerted to, we would kindly prefer them to BE QUIET. But unfortunately our dogs don’t quite view barking in the same way. So before we begin changing the behavior let's first try to understand just why our dogs bark. Dogs bark for many different reasons and they bark according to how they were bred, as well. Guarding breeds were actually bred to bark when a threat is perceived. Sporting dogs use their barks to assist their owners find prey, and some breeds bark just because they like to. LOL! Seriously, dogs bark for many different reasons. Your Miniature Schnauzer could be barking because he's bored, lonely, hungry, wants to play, wants to go out to potty, sees a stranger, sees another animal, sees anything interesting… there are hundreds of reasons. Your Miniature Schnauzer really is just a dog and that’s what dogs do... they bark. Of course, there are those times when your Schnauzer’s barking is unwarranted and just plain annoying. It's almost as if he is doing it on purpose just to upset you. But of course he is not although there may be some form of manipulation on your Schnauzer’s part. Let’s say you are watching TV and your Schnauzer drops his squeaky toy at your feet at lets out a bark. Obviously your Schnauzer wants to play, but you are right in the middle of a great movie so you ignore him. After a second or two with no response from you, your Schnauzer barks some more. You look down at your dog for a moment and then go back to watching TV. 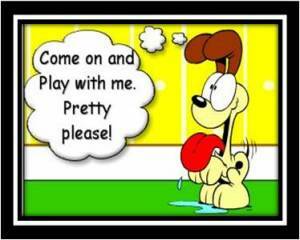 So your Schnauzer waits a few more seconds and when you do not engage him in play, he barks again and then again. Maybe you say hush or quiet or stop barking! So your Schnauzer thinks, Hmm... I'm finally getting somewhere with my owner. I’ll keep barking and see what happens next. So your Schnauzer barks even more and guess what? Because you don't want to be bothered at the moment, you finally pick up the squeaky toy and throw it across the room. Your Schnauzer runs to get the toy, returns with it, drops it at your feet, and barks some more. So you once again, throw the toy across the room. Your Schnauzer is finally getting what he wants so his barking stops. Well, guess what? You’ve just been trained to throw a squeaky toy for your dog to chase after when he barks at you. Congratulations! All joking aside what really happened is you just trained your Miniature Schnauzer that if he barks for something he wants you will comply. What's An Owner To DO? It's important that your Schnauzer respects you and knows you are in charge. Dogs behave best and are actually happier this way. (alpha dog or leader or the pack). Your Miniature Schnauzer must respect your leadership. In the above example the Miniature Schnauzer wanted to play and was harassing his owner to do so. By finally giving-in, the owner actually not only reinforced the barking behavior, but taught the dog that repeated barking works best to get what he wants. And now your home is a bark zone. Manipulation Barking: In order for you to train your Miniature Schnauzer to stop barking as a way to get what he wants, you must convey that the behavior is undesirable. And it is actually simple to do: just ignore your Schnauzer. i.e Take a form of action that shows you are not pleased with his behavior. You can do this by turning your back to your dog. It's sort of like giving your Schnauzer the cold shoulder. So when your Schnauzer starts to bark at you in order to get you to do something, you need to turn your back to him right away. Do not look at him or even say no. Just get up and turn so that your back is towards your Schnauzer. By doing this, you are conveying through your body language that he is not worthy of your attention when he acts this way. At first, your dog may be confused about this and most than likely will bark even more. After all, repetitive barking got you to perform in the way he wanted before, right? Now here's the really important part of this training method most folks mess up. And it's SUPER IMPORTANT... Consistency. As in all aspects of dog training, consistency is very important. You must ensure that you do not change your mind halfway through this process and give in to what your Schnauzer wants no matter how much barking or how loud he barks. If you give in, you will make your dog's barking much worse because now you've taught your dog that he just needs to be a little bit more persistent and louder when he barks in order to get his way. So be sure to remain consistent in the action of turning your back to your dog. Your Schnauzer will soon realize that his barking causes you to ignore him and that's not what he wants. And so, the bad behavior ceases. dog training tip Be consistent when giving both verbal cues and non verbal cues or signals to your Miniature Schnauzer. Always use the same command for the desired behavior. Does Your Schnauzer Bark Excessively?